One of my favorite comfort dishes is tiny potatoes pan fried in a wok with herbs, accompanied by fresh-made onion relish. For a 3 pound bag of golden potatoes, I use only one stick of butter. 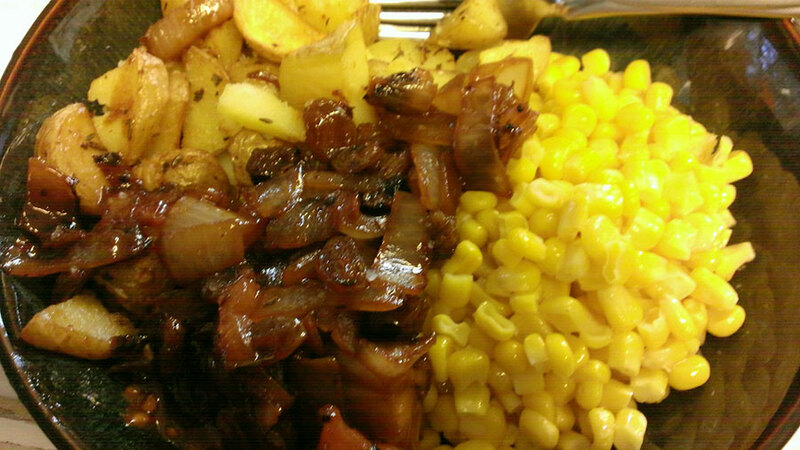 It takes only ten minutes to chop everything, and twenty minutes to fry up the potatoes and then the onions. Drain the potatoes in paper towels in a bowl while you fry the onions at the end. It is a dish with no salt, and the sweet and sour onion relish is perfect with it. Better than going out to a restaurant any day. Categories: low salt, Quick meals, Vegetarian | Tags: Low salt comfort food | Permalink. Sounds yummy! Any chance a whole stick of is really needed? You can get by with half a stick if you like, or less potatoes. For me, it is more about comfort than need. LOL. You can even substitute oil of your choice if dairy causes you to pause. I tend to use a whole bag of potatoes, and two large maui onions, so a stick of butter is just enough to coat the potatoes on the bottom layer, as you keep turning them over. Typically I have a quarter left to use or not depending on how big the onions are. Butter is delicious as a treat. It would not hurt the recipe at all to be modified for a different oil, or quantity. I would think 1/2 to 2/3 would be necessary to both cook the potatoes and provide the ‘burnt butter’ for the onion recipe afterwards. Happy cooking.